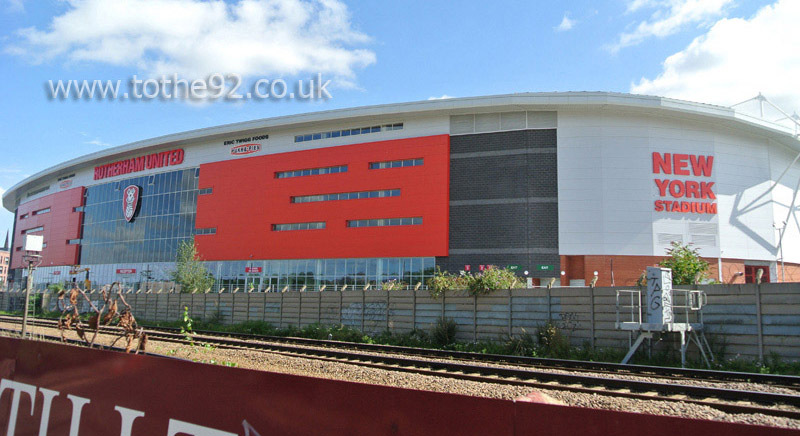 Rotherham United relocated to the New York Stadium in 2012 after 5 years at the Don Valley. They relocated to the 25,000 seater Don Valley stadium on a temporary basis in the hope that either the Millmoor rent debate could be resolved or a new stadium in Rotherham could be built. The New York stadium is a fantastic example of how to build a new ground for a lower league club without losing character. Superb unobstructed views from all areas. 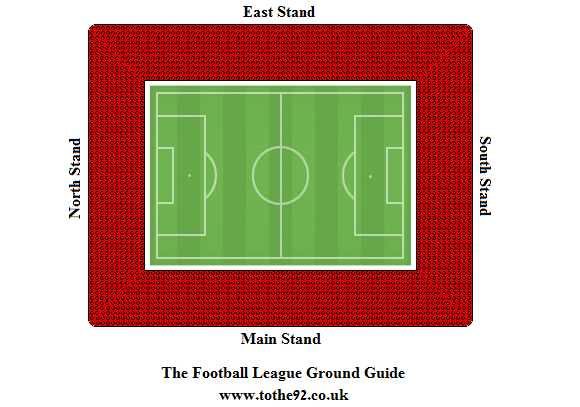 Visiting supporters are situated toward one end of the stadium in the South Stand. The excellent accoustics make it really very easy to generate a good atmosphere. The view is unobstructed and facilities are superb whilst refreshments aren't over priced. Just 5-10 minutes walk from the stadium is the town centre where you can find an assortment of pubs and places to eat. Included are 3 Wetherspoons, one of which is the Rhinoceros, situated right near the railway station. A worthwhile place to stop. Across the A630 you'll find the old Millmoor Stadium which may be worth a visit if you have a little spare time. It's also the area that you'll be best off looking for some street parking. There are closer spots that you'll need to arrive very early to grab a hold of. Alternatively, within 5-10 minutes walk of the ground you'll come across a number of pay and display car parks. There is no parking available at the stadium except for existing permit holders. The nearest / closest train station to Rotherham United's New York Stadium is Rotherham Central. It's only a short 5-10 minute walk from the stadium so if you're planning on walking, turn right as you leave the station onto Central Road. Follow this and walk all the way along the rivers edge, past the magistrates court until you reach the Main Street T-Junction. Take a left and then immediate right onto Don Street. You should already be able to see the stadium, but in case you can't, follow the road round with the stadium on your right. Travel: In terms of parking, one of the best Ive been to. A couple of big pay car parks at Millmoor and Liquid, but also a ton of street parking. Took next to no time escaping either, I parked in the street next the Prince of Wales pub near Millmoor, and was back on the motorway and gone within 10 minutes. Not a single signpost from the M1 though which would make it difficult for anyone without a SatNav. Refreshments: They have Pukka Pies, but not the chicken & mushroom? Whats that all about? Couple of decent sized pubs on the way from Millmoor to the ground, including Liquid where you can park as well, and loads of shops down the main road between the grounds, so plenty outside. Impressions: The seated area is probably one of the best of any of these new grounds, the steps are very steep, so even only a few rows back as I was, it was high enough the view was flawless. Several other little flaws though, the turnstiles being numbered wrong on the ticket for a start, then just the one turnstile open, and a TV showing the game right in front of it meaning a bit of congestion created when it could easily have been avoided. Two food kiosks in a fairly small concourse though, so that was a plus, as most smaller away ends just have the one. On the outside though, nothing too special, a small red Cardiff. Club shop was disappointing too, no badges, and as I overheard a few fans complaining about, no prices on anything which put a lot of people off buying anything. Anything Else: Possibly the most pointless bit of post match policing ever…nobody was allowed to walk around the back of the East Stand from the South side of the stadium, so we were all sent back, not allowed to walk along the front of the West Stand, but forced to walk on a little path low down in front of the walkway in front of the West Stand, while all the Rotherham fans sat in the West were walking on that walkway above us…if this sounds silly and complicated, it was made even sillier and more complicated by the fact the South Stand was split with both sets of fans on this day, so it wasnt even just a case of separating the home and away fans, as the home fans in the South Stand had to walk down with the away fans! If they ever have a bit of a dodgy game here, trouble is bound to kick off there, especially as the two sets of fans will be separated by nothing but height, and that would be easy to negotiate if a few scallies wanted a fight! Enjoy: Like a lot of new grounds, a little dull on the inside, and a disappointing atmosphere, but with it being so close to the old ground, it has everything in place around the ground, meaning it is still a goo away day. 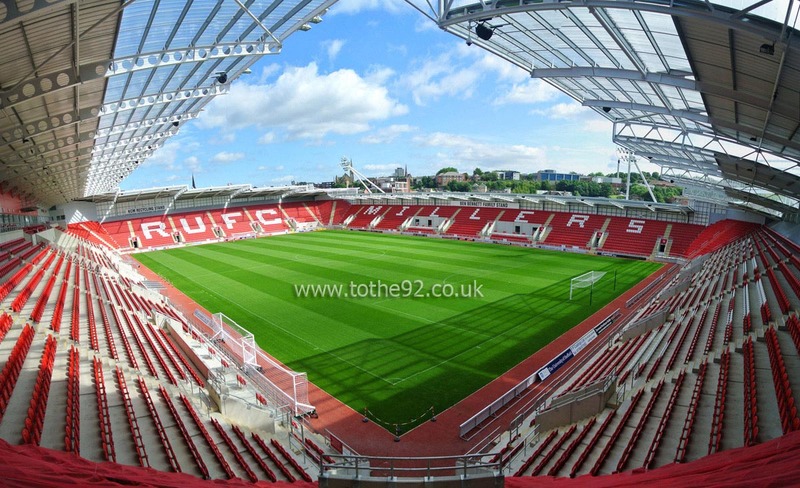 Have you been to Rotherham United's New York Stadium? To tell us about your experiences and to feature on the site, simply complete the fans review form below!